Harvestmen, commonly called Daddy Longlegs, are arachnids, like spiders, but they differ from spiders in several key areas: they have no venom glands; the have only one body segment, rather than two; and they have two eyes that sit atop the fore front of their bodies, rather than eight. 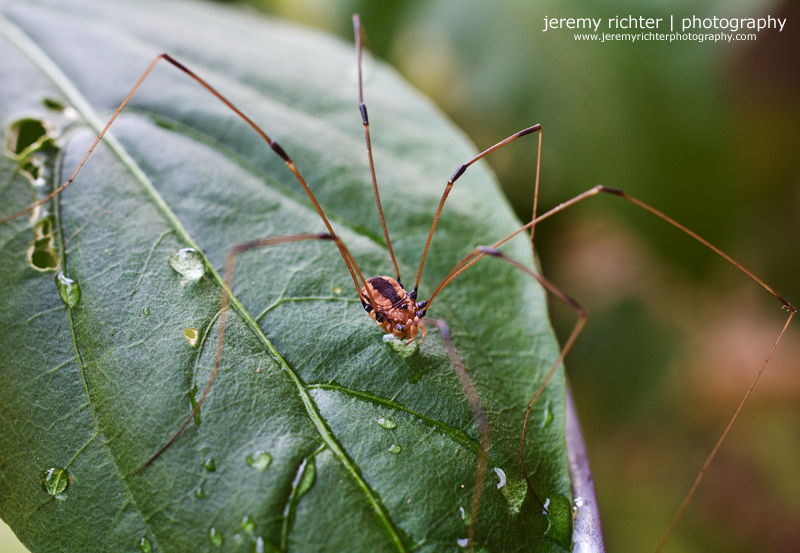 Harvestmen live only one year, dying in the winter when they are beset by cold. Around my house, harvestmen are a pretty common site. And because of the insects that are drawn to my small vegetable garden, they are a welcome site. I beg them to prey on the six-legged critters to their belly's content (which probably isn't much since harvestmen only grow to be 1/4" long, excluding their legs of course). After watering my peppers the other day, I noticed this fellow stopping for a drink, and who can blame him, with as hot as it's been.